We describe a means to quickly and simply measure the lung diffusing capacity in mice and show that it is sufficiently sensitive to phenotype changes in multiple common lung pathologies. This metric thus brings direct translational relevance to the mouse models, since diffusing capacity is also easily measured in humans. The mouse is now the primary animal used to model a variety of lung diseases. To study the mechanisms that underlie such pathologies, phenotypic methods are needed that can quantify the pathologic changes. 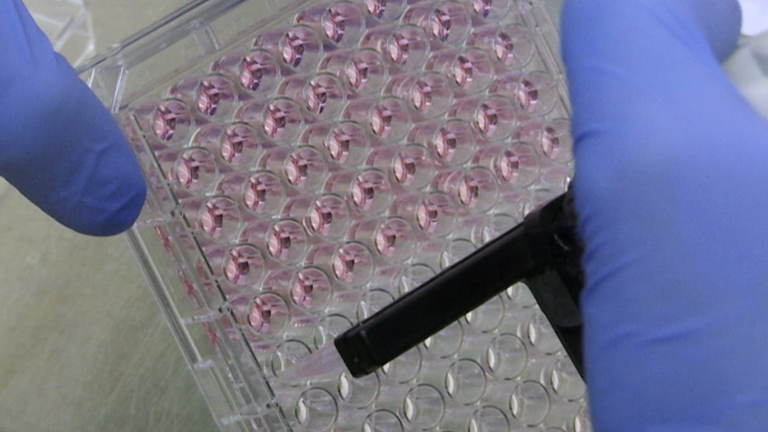 Furthermore, to provide translational relevance to the mouse models, such measurements should be tests that can easily be done in both humans and mice. Unfortunately, in the present literature few phenotypic measurements of lung function have direct application to humans. One exception is the diffusing capacity for carbon monoxide, which is a measurement that is routinely done in humans. In the present report, we describe a means to quickly and simply measure this diffusing capacity in mice. The procedure involves brief lung inflation with tracer gases in an anesthetized mouse, followed by a 1 min gas analysis time. We have tested the ability of this method to detect several lung pathologies, including emphysema, fibrosis, acute lung injury, and influenza and fungal lung infections, as well as monitoring lung maturation in young pups. Results show significant decreases in all the lung pathologies, as well as an increase in the diffusing capacity with lung maturation. This measurement of lung diffusing capacity thus provides a pulmonary function test that has broad application with its ability to detect phenotypic structural changes with most of the existing pathologic lung models. The mouse is now the primary animal used to model a variety of lung diseases. To study the mechanisms that underly such pathologies, phenotypic methods are needed that can quantify the it the pathologic changes. Although there are many mouse studies where ventilation mechanics are measured, these measurements are generally unrelated to the standard assessments of pulmonary function normally done in humans. This is unfortunate, since the ability to perform equivalent measurements in mice and human subjects may facilitate the translation of results in mouse models to human disease. One of the most common and easily made measurements in human subjects is the diffusing capacity for carbon monoxide (DLCO)1,2, but this measurement has only rarely been done in mouse models. In those studies where it has been reported3-7, there have been no follow-up studies, in part because the procedures are often cumbersome or may require complex equipment. Another approach is to use a CO rebreathing method in a steady state system, which has the advantage of being able to measure CO diffusion in conscious mice. However this method is very cumbersome, and results can vary with the level of the mouse’s ventilation as well as O2 and CO2 concentrations8,9. These difficulties seem to have precluded routine use of diffusing capacity to detect lung pathologies in mice, despite its several advantages. To circumvent the problems with measurement of diffusing capacity in mice, details of a simple means to measure it in mice have been recently reported10. The procedure eliminates the difficult problem of sampling uncontaminated alveolar gas by quickly sampling a volume equal to the entire inspired gas. This procedure results in a very reproducible measurement, termed the diffusion factor for carbon monoxide (DFCO), that is sensitive to a host of pathologic changes in the lung phenotype. The DFCO is thus calculated as 1 – (CO9 / COc) / (Ne9 / Nec), where the c and 9 subscripts refer to concentrations of the calibration gases injected and the gases removed after a 9 sec breath hold time, respectively. DFCO is a dimensionless variable, which varies between 0 and 1, with 1 reflecting complete uptake of all CO, and 0 reflecting no uptake of CO. In this presentation we show how to make this diffusing capacity measurement, and how it can be used to document changes in nearly all of the existing mouse lung disease models, including emphysema, fibrosis, acute lung injury, and viral and fungal infections. NOTE: All animal protocols were approved by the Johns Hopkins University Animal Care and Use Committee. Prepare 6 C57BL/6 control mice for the DFCO measurement, by anesthetizing them with ketamine and xylazine as outlined in step 2.3 below. Prepare all of the other mice with the different lung pathologies shown in Table 1 by using the same procedure as for the controls. Specific details needed to establish each of these models are found in the relevant references. Control mice and those in the other pathologic cohorts are all 6-12 weeks of age. Set up the gas chromatograph module supplied with the machine to measure peaks for nitrogen, oxygen, neon, and carbon monoxide. For this application use only the neon and CO data. NOTE: This instrument uses a molecular sieve column with helium as carrier gas, with a 12.00 µm film, 320.00 µm ID and 10 m length. The chromatograph column has a volume of 0.8 ml, but we used 2 ml to ensure adequate clearing of the connecting tubing with the sample. At the start of each experimental day, prior to making measurements of the samples from the mice, take a 2 ml sample directly from a gas mixture bag containing approximately 0.5% Ne, 0.5% CO, and balance air, and use this sample to calibrate the gas chromatograph. Anesthetize mice with ketamine (90 mg/kg) and xylazine (15 mg/kg), and confirm anesthesia by the absence of reflex motion. Apply veterinary ointment on the eyes to prevent dryness. Tracheostomize the mice with a stub needle cannula (18 G in adults or 20 G in very young mice). NOTE: The DFCO is completed in less than 10 min after anesthesia and prior to any mechanical ventilation or other procedures. In mice greater than 6 weeks of age, use a 3 ml syringe to withdraw 0.8 ml of gas from the gas mixture bag. Connect the syringe to the tracheal cannula and quickly inflate the lung. Using a metronome, count 9 sec, and then quickly withdraw the 0.8 ml (exhaled air). Dilute this withdrawn 0.8 ml exhaled air to 2 ml with room air, allow it to rest for at least 15 sec. Then inject the whole sample into the gas chromatograph for analysis. While analyzing this first DFCO sample, inflate the mouse lung with a second 0.8 ml from the gas mixture bag, and then process this sample identical to the first sample. Average the two DFCO measurements. NOTE: For measurements in mice as young as 2 weeks of age, use a volume of 0.4 ml, since 0.8 ml is too large a volume to make measurements in lungs of very young mice. It is better to use the 0.8 ml volume for mice older than 6 weeks, and that if the 0.4 ml volume is needed for some mice, it should be used consistently for all mice in the cohort being studied. Calculate DFCO as 1 – (CO9 / COc) / (Ne9 / Nec), where c and 9 subscripts refer to concentrations of the calibration gases injected and the gases removed after a 9 sec breath hold time, respectively. Analyze and compare differences with a one-way ANOVA and assess the significance level with Tukey’s correction for multiple comparisons in all the cohort mice. Consider p <0.05 as significant value. NOTE: All of the mice used here were part of experimental studies involving several subsequent measurements of lung ventilation, mechanics, lung lavage, or histology, which are not reported here. In addition, since the method is the same in all the experimental models as was done above in the control mice, only the results from the various pathologic models are presented. Further information on these models is presented in the supplemental table. Euthanize the animals by deep anesthetic overdose followed by cervical dislocation or decapitation. Where needed, remove the lung cells and/or tissues from the dead mice for further biologic or histologic processing and analysis. Figure 1 shows the DFCO measurements from the adult mice in groups A, B, C, D, E, and F. There were significant decreases with both the Aspergillus and influenza infections, as well as significant decreases in the fibrotic, emphysematous, and acute lung injury models. Figure 2 shows the Group G developmental changes in DFCO over time as the mice age from 2-6 weeks. There was a slight but significant increase with lung development over this time course. The effect of using a smaller inflation volume was also quite apparent at the 6 week time point. There was a tendency for the females to have a slightly higher DFCO, but this was only significant at the 5 week time point. Table 1: Listing of the different mouse models where the DFCO was measured. Figure 1: Measurement of DFCO in the control C57BL/6 mice (Group A) and in each of the 5 different pathologic models. 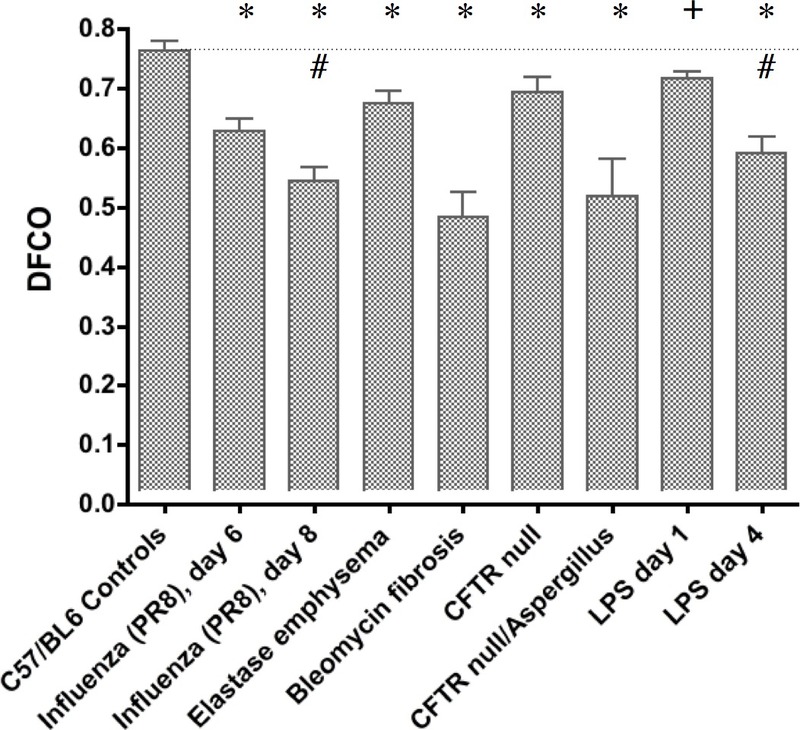 Shown are results 6 and 8 days after the PR8 influenza (Group B), 21 days after intratracheal elastase (Group C), 14 days after intratracheal bleomycin (Group D), 12 days after aspergillus infection in the CFTR null mice (Group E), and 1 and 4 days after LPS instillation (Group F). The * indicates P <0.01 vs. control, the # indicates P <0.01 between the 6 and 8 day influenza mice and the 1 and 4 day LPS mice, and the + indicates P <0.05 vs. control. 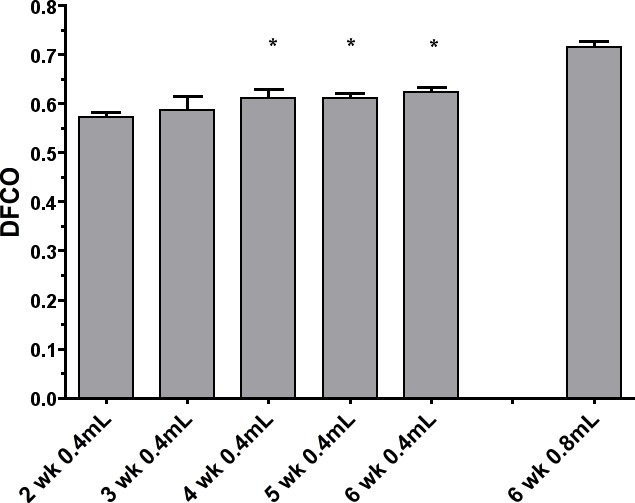 Figure 2: Measurement of DFCO in male C57BL/6 mice from 2 through 6 weeks of age (Group G). The measurements were made in all mice with an inflation volume of 0.4 ml, and in the 6 week old mice a second measurement was made with 0.8 ml. With the 0.4 ml volume, there were significant increases in DFCO between the 2 week male and those at 4, 5, and 6 weeks (P <0.05). In the present work, we defined a new metric to quantify the gas exchanging ability of the mouse lung. This metric is analogous to the diffusing capacity, a common clinical measurement that measures the primary function of the lung, that is, its ability to exchange gas. The diffusing capacity is the only lung functional measurement that can be easily and quickly done in both mice and humans. For the detection of lung disease in mice, a major objective is to quantify changes in lung function between control and experimental cohorts. To achieve this goal, we have defined and utilized the DFCO to demonstrate its capability of quanitfying phenotypic changes in most of the most common models of lung disease in mice, including functional changes with lung development. One assumption inherent in the approach that simplifies the DFCO measurement in mice is that the effect of unmixed inspired gas in the anatomic and equipment dead space is ignored. However, as previously described10, the use of the 0.8 ml inflation volume introduces a small but consistent error in all the measurements. The magnitude of this error is a function of the relative sizes of the inflation and dead space volumes. In the present approach, this error is minimized by eliminating the dead space in stopcocks or T-connectors, and as shown in the video, simply uses a fingertip to seal the syringe and facilitate gas transfer. This procedure results in a high repeatability between measurements. The effect of the smaller inflation volume required in the young mice is made clear in the 6 week old mice shown in Figure 2, where the initial 0.4 ml test was immediately followed with an 0.8 ml test in each mouse. With 0.8 ml the DFCO value in was in the range for C57BL/6 mice in the other groups, but the measurement with 0.4 ml is consistently smaller. This is a direct manifestation of the fact that with the smaller volume, the recovered 9 sec sample has a greater fraction of the dead space air, which just consists of the control gas concentrations. This fact manifests itself as a smaller fractional change in the CO concentration, which brings it closer the change in Ne concentration. With an increased ratio of CO/Ne, the calculated DFCO (1 – this ratio) is thus smaller. In the many models of lung pathology shown in Figure 1, there were a significant decreases observed in DFCO. However, there are several different reasons why the DFCO decreases in these different models. In fibrosis caused by the single dose of bleomycin, there is inflammation and a thickening of the diffusion barrier that leads to a reduction in diffusing capacity16. In emphysema, there is a loss of surface area acts directly to decrease both the surface area for diffusion and the blood volume in capillaries that had been in the destroyed walls. No dose-response relations with the elastase are presented here, but unpublished data shows a good correlation of the DFCO with the level of emphysematous damage. With the influenza infection, there is reduced diffusing capacity likely as a result of both a thickening of the diffusion barrier and an increase in consolidated unventilated regions of lung. In the PR8 influenza model used here, this worsens over time (as reflected in the further significant decrease in DFCO at day 8), and the mice generally die at around day 10. In the CFTR null mice, there was a smaller DFCO at baseline, but these mice are made on a mixed genetic background17, so there may be structural differences with the C57BL6 controls. However, the Aspergillus infection caused a more substantial significant decrease in DFCO, and reasons for this decline with the fungal infection are likely similar to those with the influenza. The LPS results in acute inflammation that causes a significantly decreased DFCO, likely from edematous thickening of the diffusion barrier and unventilated regions of lung filled with fluid. With the dose of LPS used, the decrease in DFCO is greatest at day 4 or 5 and then recovers back to control by day 10 (data not shown). For the analysis of changes in DFCO with lung growth in the young mice, the 0.4 ml inflation volume clearly allowed reproducible measurements, and was able to show a slow increase in diffusing capacity as the lung reached adult maturity (Figure 2). The effect of using a smaller 0.4 ml inflation volume in decreasing the calculated DFCO is also what was expected, but the larger 0.8 ml volume cannot be used in the smaller mice. But changes with development or pathology should still be reproducibly detectable even with the 0.4 ml volume. In conclusion, this video and accompanying manuscript shows how to obtain a functional measurement in mice that is similar to what can be measured in humans. The metric reflects the ability of the lung to exchange gas with a variety of lung structural changes caused by the most commonly studied pathologies. This diffusion factor for carbon monoxide (DFCO) is highly reproducible, and sensitive enough to detect functional and structural changes with most experimentally induced pathologies in young or old mice. The fact that it is directly analogous to similar measurements made in humans to assess lung disease, makes it a simple way to obtain a very relevant metric to phenytype mouse lung pathologies. No conflicts of interest, and nothing to disclose.